It’s easy to relate to Vanellope Von Schweetz. She’s just a girl trying to do what she loves, but bullies and jealous kings don’t want to see her succeed. She’s not the type to let anyone else keep her down though! With her pal Wreck-it Ralph, she’s ready to take on anything that the video game world throws at her. Actually, she’s even ready to take on the whole internet this time around. That’s a great attitude for any young girl to have! If life tries to push you down, you just keep on racing to the finish line. Nuts to those bullies! Of course, if your little girl is a fan of the character, then maybe it’s time you let her dress up like her so she can get that “go get ‘em” attitude of the Disney character. 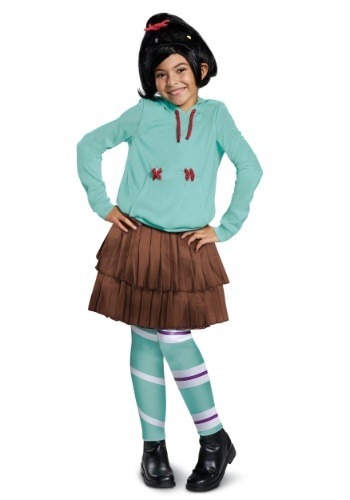 This child deluxe Vanellope Von Schweetz costume is an officially licensed costume from Ralph Breaks the Internet. The costume comes with a jersey-knit, turquoise hooded sweatshirt that has faux “licorice” rope around the neck and matching details on the front pouch pocket. The skirt fits with an elastic band around the waist and is made out of a brown twill material. The costume also comes with a pair of turquoise leggings that have striped patterns. Finally, to finish the whole look off, this outfit includes a wig, which recreates the look of Vanellope’s adorable ponytail style. If your child has a feisty attitude and a need to race, then she might just be ready for this Vanellope Von Schweetz costume. Be sure to check out our other Wreck-it Ralph 2 costumes! You could even dress up like the titular character to become Vanellope’s best friend for a round of trick or treating this year.